Born and raised in Gothenburg, Lennart started off at local side BK René before signing for Örgryte as a youth player. Making his debut in 1956, he helped the club to promotion in 1959 and a third place finish in the Allsvenskan in 1960, whilst playing part-time and working as a fire-fighter. He gained international recognition in March 1961 when he made his Sweden debut in a friendly against Czechoslovakia, and went on to win 29 caps before the end of 1964. The 29 year-old wing-half came to the attention of Jerry Kerr whilst playing for Örgryte against Dunfermline Athletic in a Fairs Cup tie at East End Park in October 1964. Although beaten 4-2, it was Lennart's team-mate Örjan Persson that caught the United manager's eye, and the left winger was at Tannadice by December. A few weeks later, regular left-half Stewart Fraser broke his ankle and Kerr moved to bring Wing to Tannadice as a replacement. Before the transfer could go ahead, Lennart had to ask for a leave of absence from the fire service, and was originally granted a year. Making his debut against St Mirren on a snow covered Tannadice in January 1965, he went on to retain his position over the rest of the season as United embarked on a fantastic run that saw them defeated only twice in the league. At the end of their first season, Persson and Wing returned home and turned out for Örgryte, thereby missing United's run to the final of the Summer Cup that year. The pair also played for Sweden in a World Cup qualifier against Cyprus in May 1965, becoming the first Dundee United players to be capped at full international level whilst playing for the club. The pair returned to Tannadice, and the excellent form continued on through the 1965-66 season. After receiving an extension to his absence from the fire service back home, the Swede scored his first goal for the club in memorable fashion, converting the 89th minute penalty to make it 5-0 to secure our record victory over Dundee in September 1965. Whilst with United he collected another seven international caps throughout the second half of 1965. Another excellent season culminated with United finishing fifth in Division One, the club's highest ever placing in the Scottish Football League at the time. That league position also meant that the club had qualified for Europe for the first time. Lennart's experience at European and international level was invaluable when the club made their first venture into Europe, defeating the Fairs Cup holders Barcelona at home and away, and competing well with Juventus before narrowly losing to the Italian giants. When his contract expired at the end of the 1966-67 season, the popular Swede asked for a further extension to his already long leave of absence from the fire service. His request was denied and he returned home but continued to play part-time football, signing for Örgryte and then Kungsbacka. In 2011, Lennart was inducted into the Dundee United Hall of Fame. Lennart was born on this date in Gothenburg, Sweden. 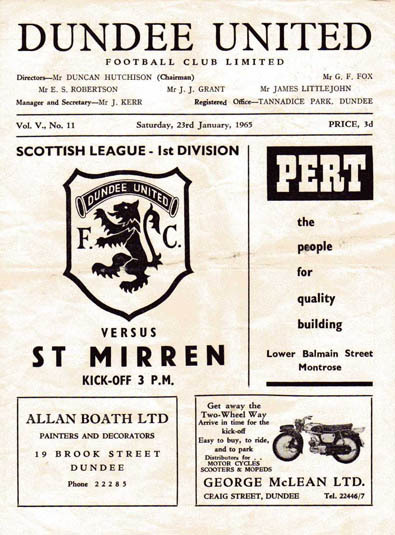 United went into the first league derby of the 1965/66 season only ten days after losing to their bitter rivals 3-1 in a League Cup tie at Tannadice. However having won their last three league games at Dens, the Terrors were quietly confident that they could pick up a badly needed result to end a run of four defeats on the bounce. One of manager Jerry Kerr’s main tactical alterations for the clash against Dundee was to hand 17 year-old half-back Frannie Munro the task of marking the Dark Blues’ record signing Charlie Cooke. United would also have to keep an eye on the Dens Park side’s latest signing: a 28 year old inside forward by the name of Jim McLean who had signed for Dundee for £12,000 from Clyde during the week.